The harmonica player whips out his gun, kills all three men with incredibly fast and accurate shots and that’s how ONCE UPON A TIME IN THE WEST begins. A movie that I think is the best western ever made. You can disagree with me. I don’t mind. Jill McBain (Claudia Cardinale) arrives in the boomtown of Flagstone to take up housekeeping with Brett McBain (Frank Wolff) whom she met and married in New Orleans. Jill is desperately looking to put her former life as a prostitute behind her but that dream is totally shattered as she finds that McBain, along with his three children have all been brutally murdered. The townspeople are quick to put the blame on Cheyenne (Jason Robards) a local bandit noted for his flamboyance and rough charm. But Cheyenne is for once the innocent party. The McBains were actually killed by Frank (Henry Fonda) a merciless killer in the employ of railroad tycoon Morton (Gabriele Ferzetti) who is dying from tuberculosis of the bones but is determined to stay alive long enough to see his railroad reach The Pacific Ocean. Frank’s got other plans. And those plans include the McBain ranch of Sweetwater which Jill has inherited. The ranch is sitting on a vast underground lake of fresh water. And Brett McBain’s intention was to build a railroad station right on the spot where the railroad would pass through. McBain knew that the water was worth millions and whoever controlled the water would control the town that would spring up around the station. Frank is determined to get that land. Jill is just as determined that he doesn’t. Cheyenne genuinely likes Jill and genuinely doesn’t like Frank and wants to help her out. Nobody knows what the motives and intentions of the mysterious man that they all call Harmonica are. But he moves among these four and manipulates their actions for his own dark purpose. A purpose we don’t learn until the end of the movie and one I wouldn’t dare reveal here. I love all of Sergio Leone’s movies and I’ve thought for years that ONCE UPON A TIME IN THE WEST was his highly underrated masterpiece. Most would say that “The Good, The Bad And The Ugly” takes the top honors among Leone’s films but I gotta disagree. Much as I love “The Good, The Bad And The Ugly” I love ONCE UPON A TIME IN THE WEST even more. Why? Okay, sit back. This will take a while. First of all is the title: ONCE UPON A TIME IN THE WEST. Leone is letting you know right up front he’s telling you a grown-up fairy tale. This isn’t going to be a fairy tale that has a happy ending because it takes place in the west. But it really isn’t The American West we know. The film critic Danny Peary wrote in his review of ONCE UPON A TIME IN THE WEST that Sergio Leone’s West was inhabited by a select group men who belonged to an elder race of warriors who possessed near supernatural skills with guns. And I think that’s valid. Sergio Leone’s American West is actually as much a fantasy realm as Robert E. Howard’s Hyborian Era. But in Leone’s fantasy world his warriors tote sixguns instead of swords. In fact, there’s a key scene where Charles Bronson’s Harmonica says to Henry Fonda’s Frank that he belongs to ‘an ancient race’. Second of all is Claudia Cardinale. Sergio Leone may have slighted women is his other movies but he made up for it with this one. He takes every opportunity to film Claudia Cardinale the best way he can. She’s an astoundingly beautiful woman and Leone takes advantage of that, giving her an amazing amount of close-ups where we can just take delight in how lusciously gorgeous she is. And she’s not just there as eye candy. Miss Cardinale’s character is the one that sets everything in the movie into motion. Third is Henry Fonda. 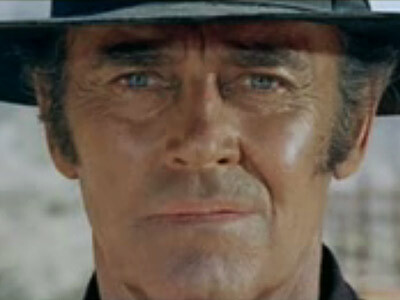 ONCE UPON A TIME IN THE WEST is legendary as the only movie where he played a bad guy and I guess we’re lucky because if Mr. Fonda had really put his mind to it we’d have gotten some of the scariest bad guys of all time from him. Henry Fonda scares the you-know-what outta me everytime he shows up on screen in this movie. He’s so scary that when this movie was first shown on American television, some of his scenes were actually cut out including Frank’s killing of a little boy. Fourth is just the way the story is told. Sergio Leone takes his time in all of his movies and this is no exception. He’ll tell the story he wants to tell in his own way and in his own time. ONCE UPON A TIME IN THE WEST is no exception. There are many scenes which have nothing but characters staring at each other. And compared to how fast the gunfights happen you might be bewildered at how much time Leone takes setting up the gunfights. But that’s because Leone is more interested in the rituals leading up to the gunfight. Fifth is the score by Ennio Morricone which I think is the best he’s ever done. 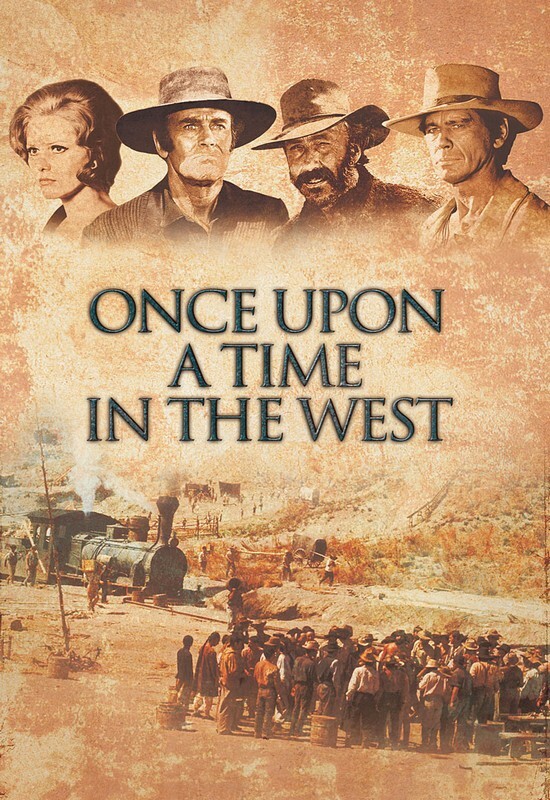 Do yourself a favor and pick up the two-disc DVD version of ONCE UPON A TIME IN THE WEST in which you’ve got commentary by guys like John Carpenter, John Milius, Claudia Cardinale and numerous others including Morricone who himself says that Leone wanted ONCE UPON A TIME IN THE WEST scored liked an opera. Every main character has their own theme music and the hauntingly evocative ‘Jill’s Theme’ is used to its greatest effect in the last ten minutes of the movie. Which is Leone’s commentary in full on the mythic Old West he loved so much. Should you see ONCE UPON A TIME IN THE WEST? It’s one of the movies in my Movies You Can’t Call Yourself A Movie Fan If You Haven’t Seen list. It’s got terrific performances by Charles Bronson, Henry Fonda, Jason Robards and the exquisite Claudia Cardinale. It’s not a western you want to see for non-stop action and bloody shootouts. But the way it’s filmed, its story and the acting it’s captivating. If you call yourself a fan of movies or a fan of westerns then ONCE UPON A TIME IN THE WEST is a movie you need to see. I always thought Henry Fonda’s intro scene was the greatest intro scene for a villain in the history of films. I can only imagine how it freaked out American audiences to see Henry Fonda gun down a kid ten minutes into a movie as he was pretty much “America’s Dad” at that point in his career. Excellent review of an underrated classic. It should be required viewing for anyone who claims to be a fan of western films… uh, okay, strike that. Required viewing for anyone who loves film. Absolutely wonderful viewing. And Fonda as the villain! Brilliant! I wonder what kinda villain Tom Hanks would make. Great review! Easily Leone’s best film. I’m perennially torn between thinking this and Good The Bad and The Ugly are Leone’s best. Every time I watch either one I come away convinced it’s the greatest. Yeah! No matter how many times I hear that line I still laugh like I’ve heard it for the first time.